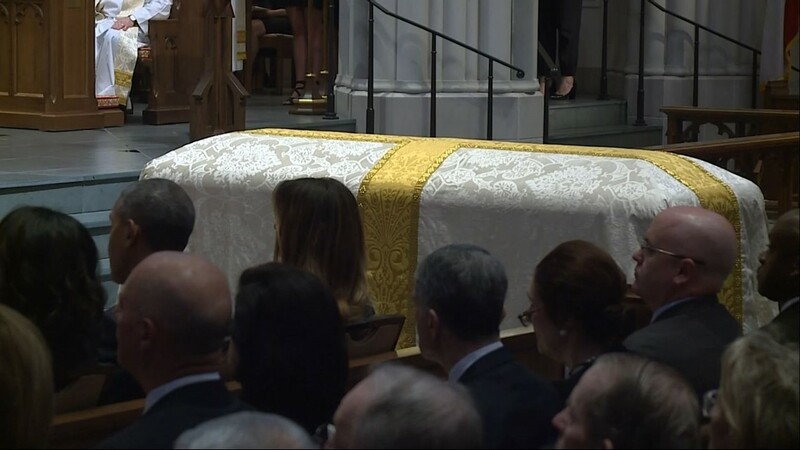 The former first lady will be laid to rest at the George H.W. 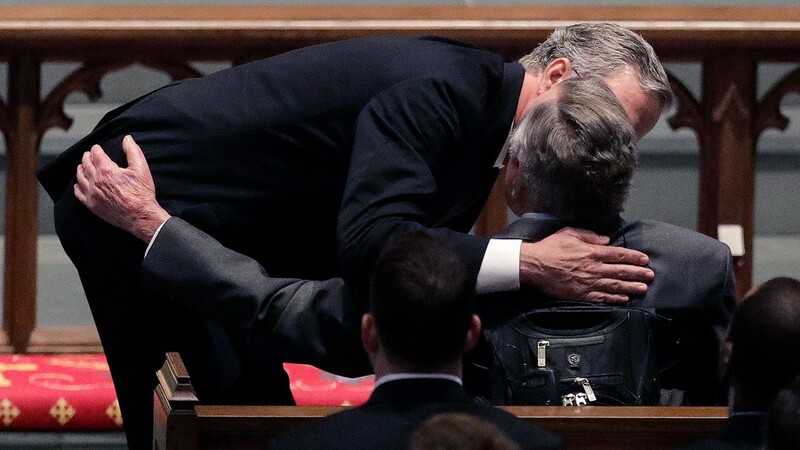 Bush Presidential Library and Museum. 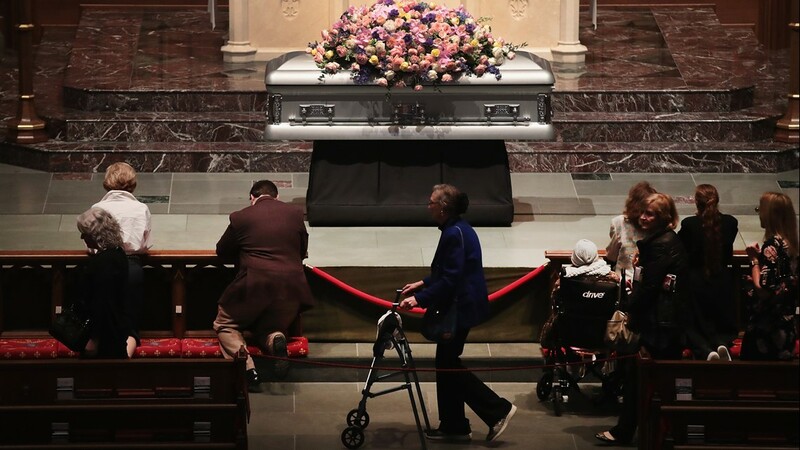 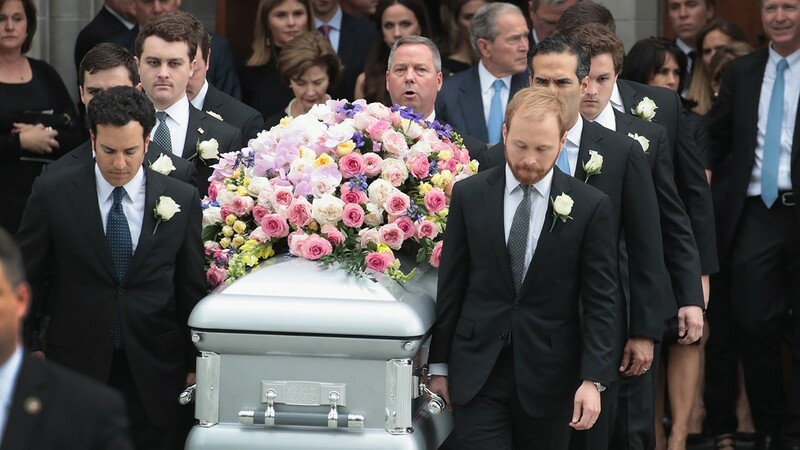 HOUSTON – Former First Lady Barbara Bush is being taken to her final resting place in College Station Saturday afternoon. 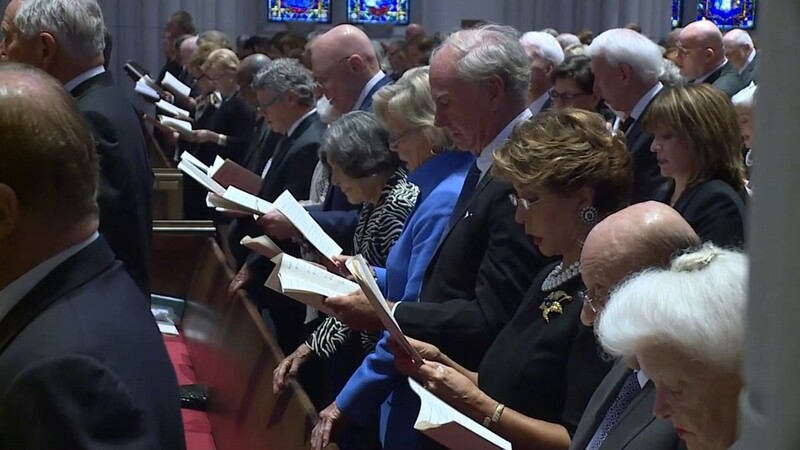 Some 1,500 guests said their final farewell to the nation's grandmother at her funeral here in Houston at St. Martin’s Episcopal Church. 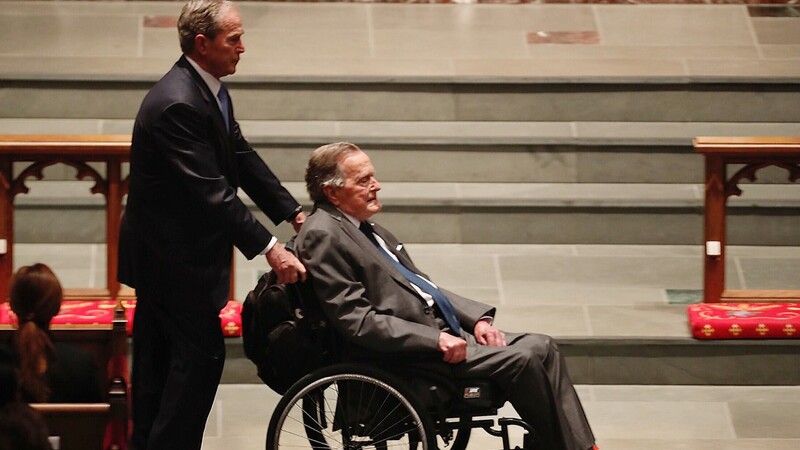 Bush died Tuesday at age 92 after a battle with COPD and congestive heart failure. 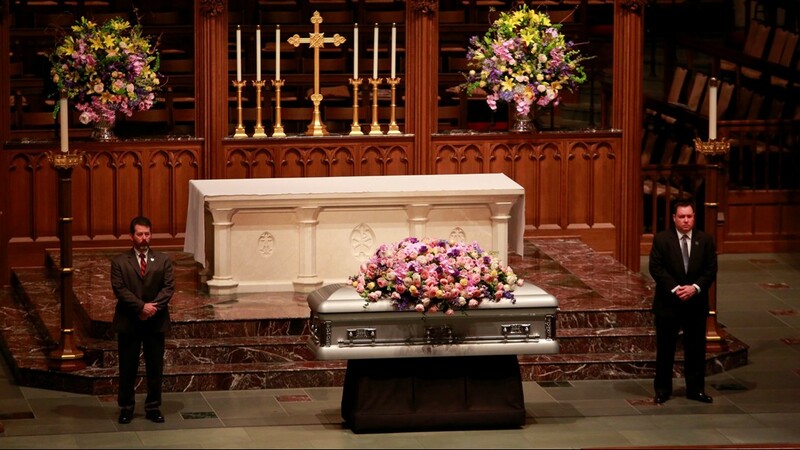 The private service is part of the second day of paying respects to the former first lady. 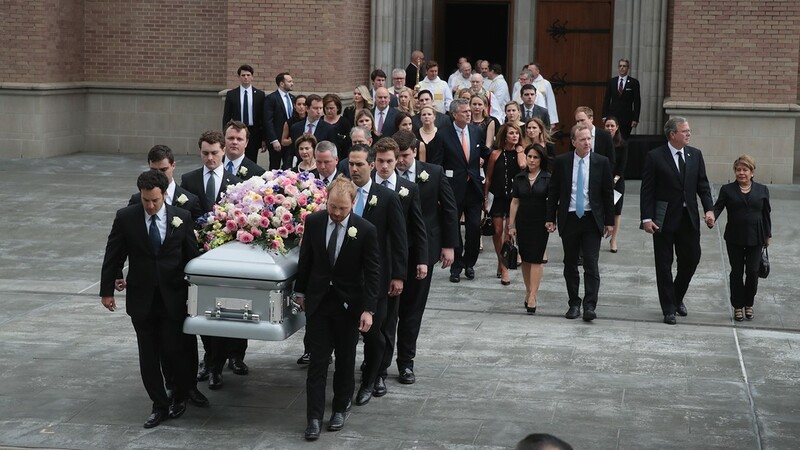 Hundreds walked past the her at a public visitation Friday. 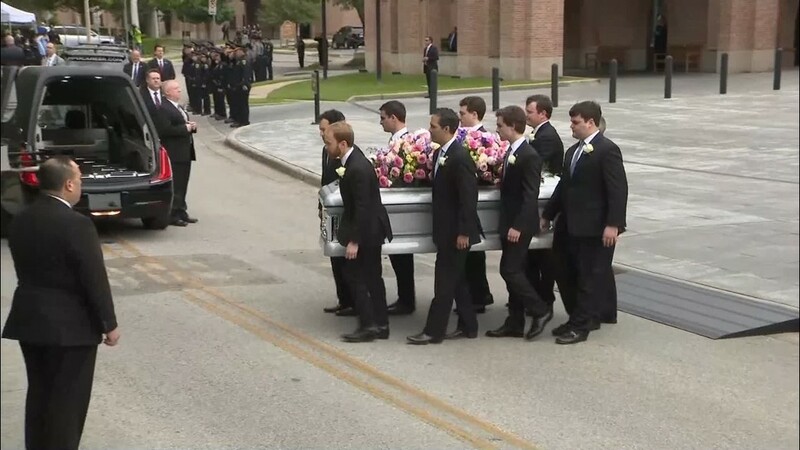 3 p.m., Saturday - The motorcade has arrived in College Station with the Texas A&M Corps of Cadets waiting. 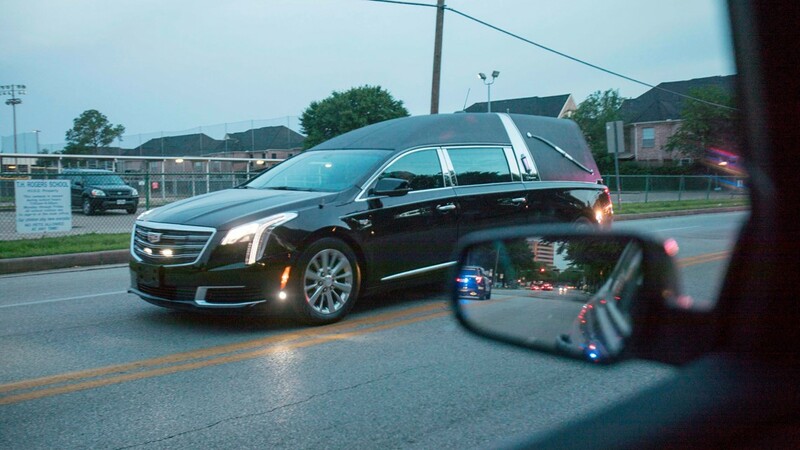 2:35 p.m., Saturday - A touching tribute seen en route to College Station. 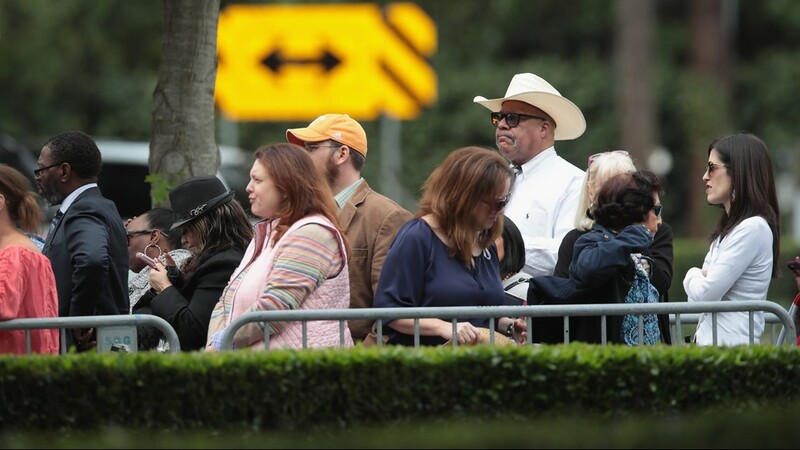 2:10 p.m., Saturday - Motorists are lining the shoulders of Highway 290 heading towards College Station so that they can get a glimpse of the motorcade transporting the remains of the former first lady. 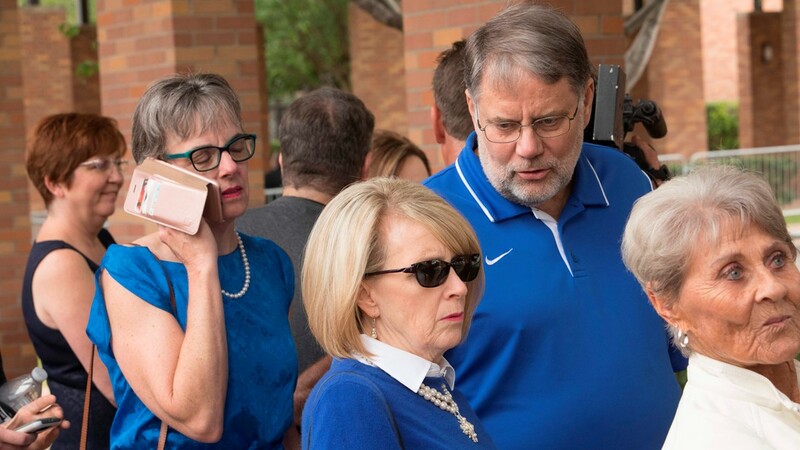 1:45 p.m., Saturday - Families are prepared for the arrival of the former first lady in College Station, So many waiting to pay their respects. 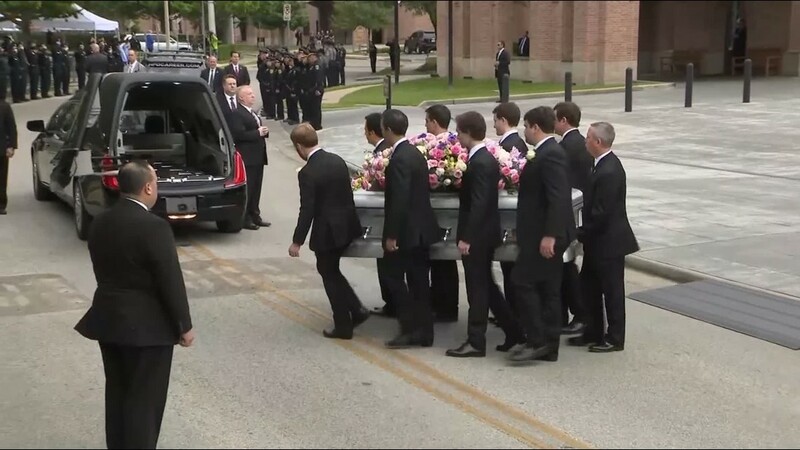 1:10 p.m., Saturday - The Texas A&M Corps of Cadets are heading to the George H.W. 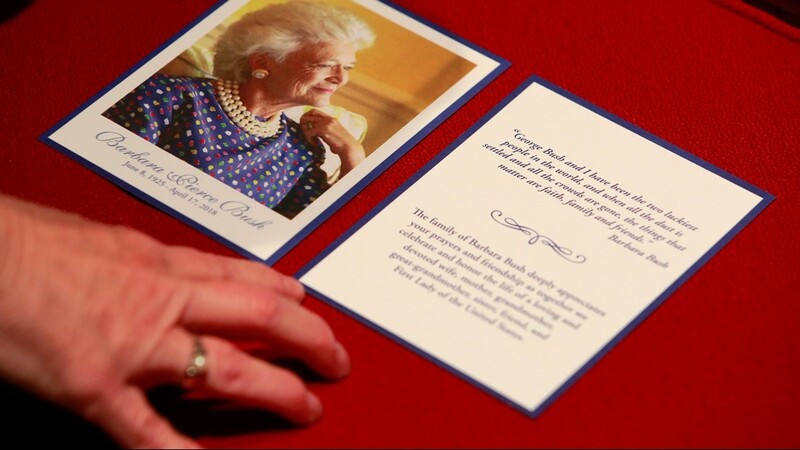 Bush Presidential Library and Museum to get ready for the arrivel of the former first lady. 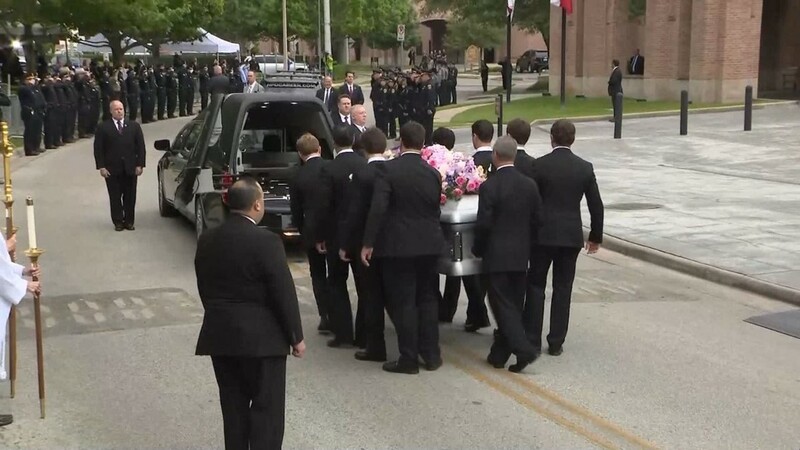 12:55 p.m., Saturday - The motorcade is preparing to head to College Station where the first lady will be buried. 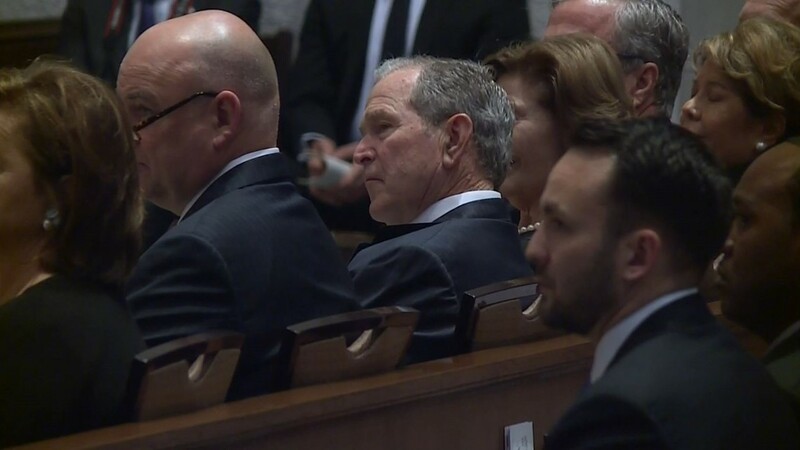 12:45 p.m., Saturday - A closer look at former President George G.W. 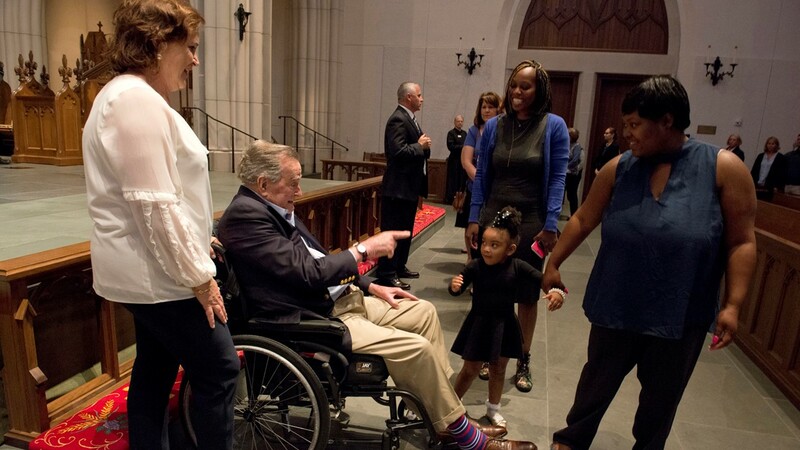 Bush's socks for today's service. 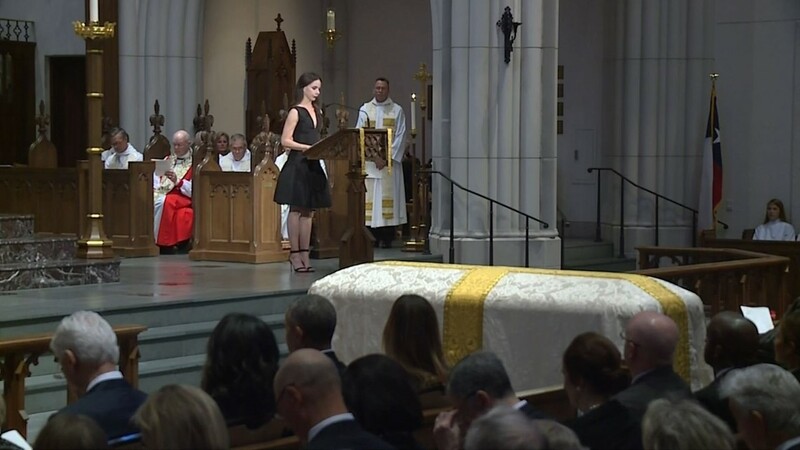 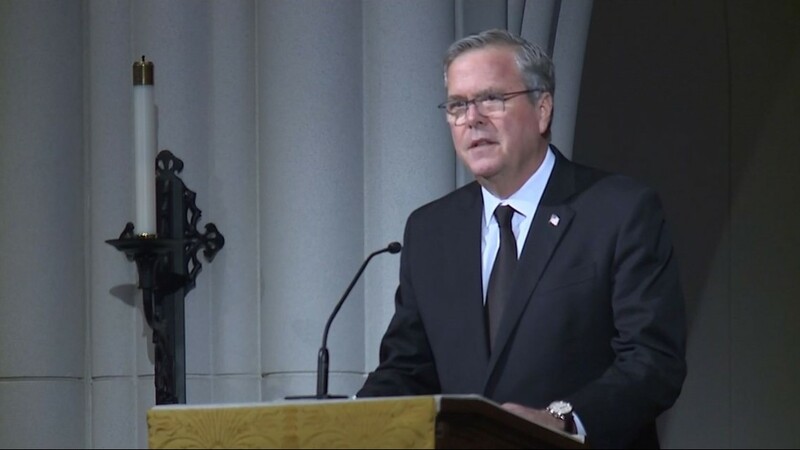 11:45 a.m., Saturday - Jeb Bush, the former first lady's son, said in his eulogy: "Barbara Pierce Bush was real, and that's why people admired her and loved her so." 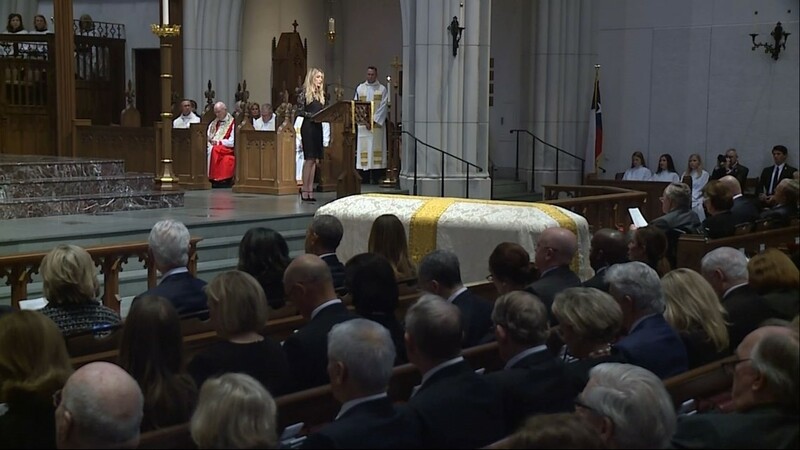 11:40 a.m., Saturday - Susan Garrett Baker, a long-time friend of Barbara Bush, has a tribute for the former first lady. 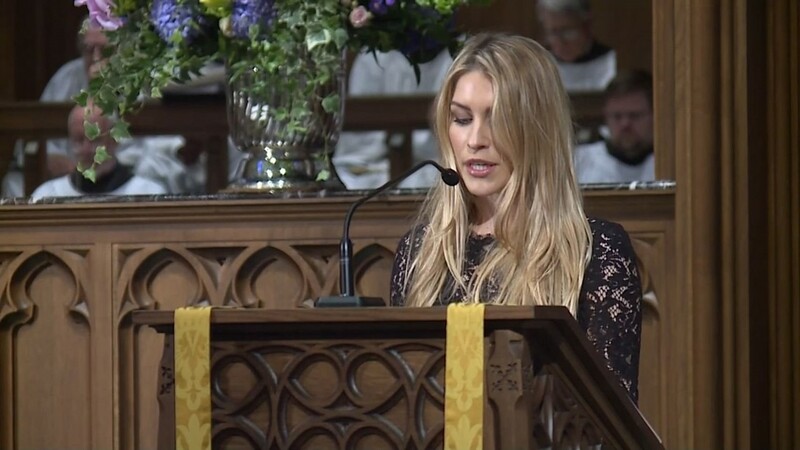 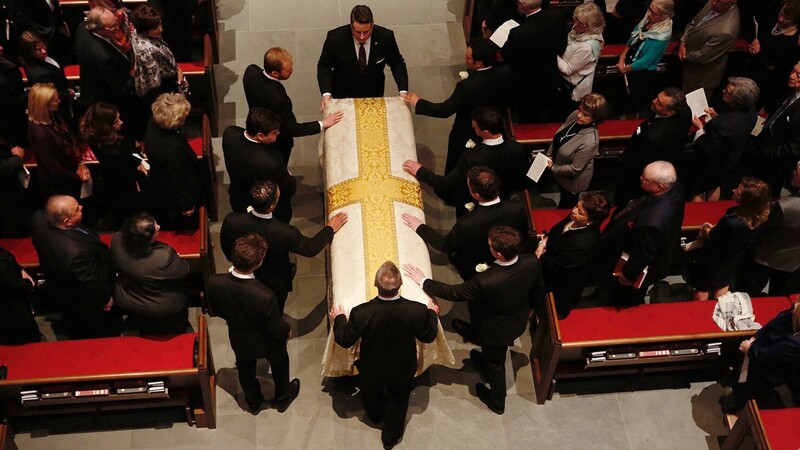 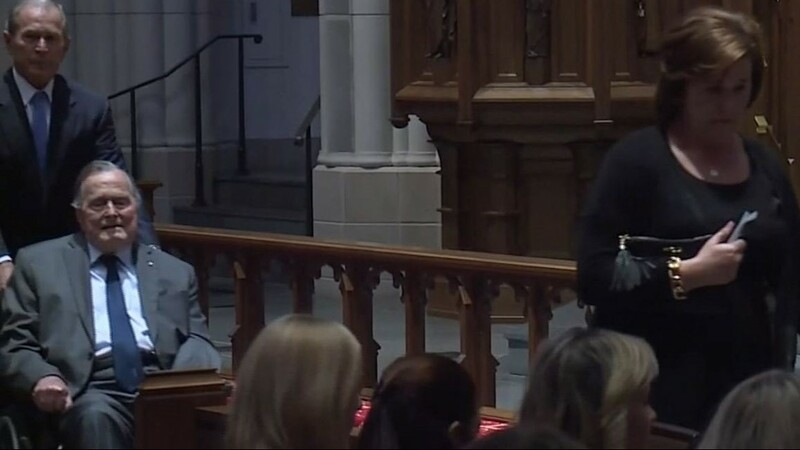 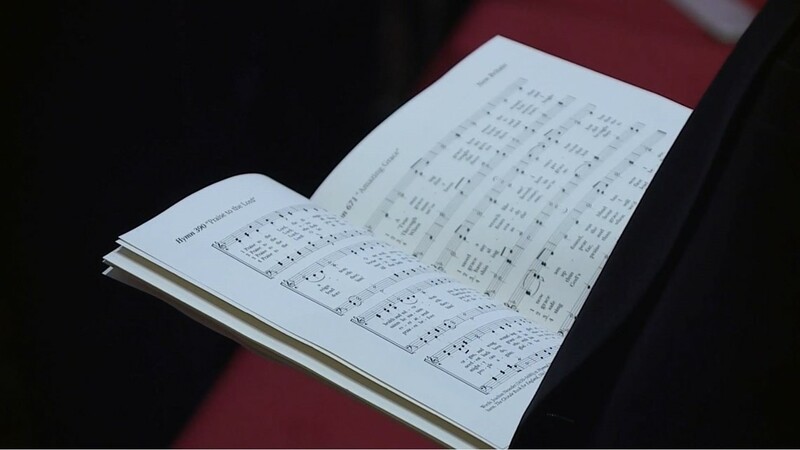 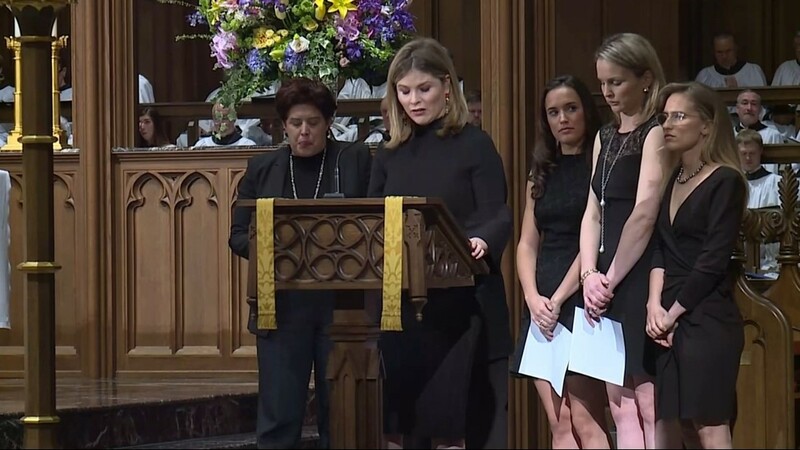 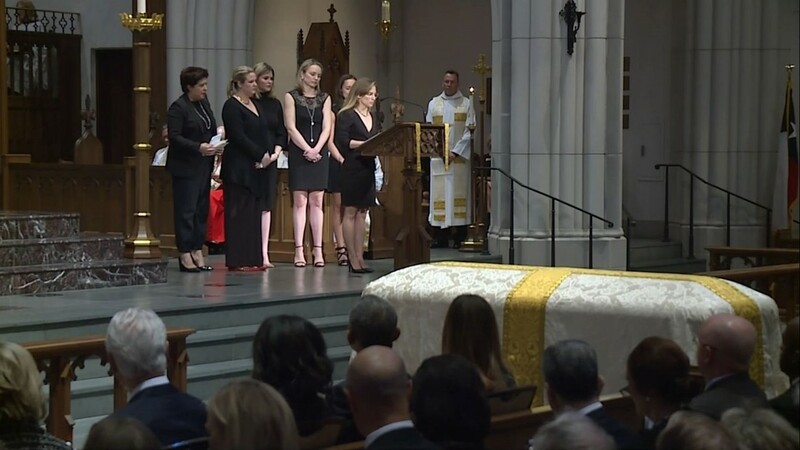 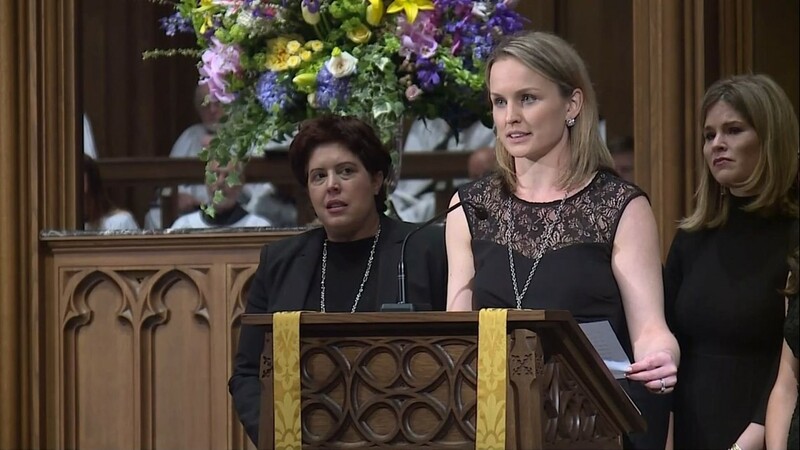 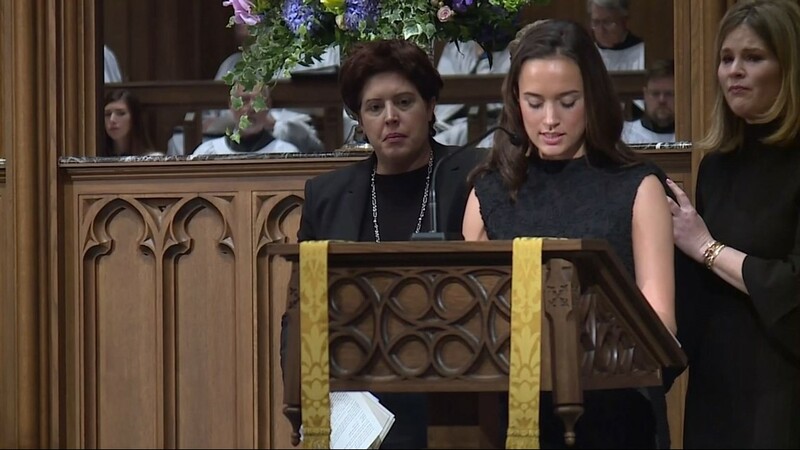 11:15 a.m. Five of Barbara Bush's granddaughters read from Proverbs during the former first lady's funeral. 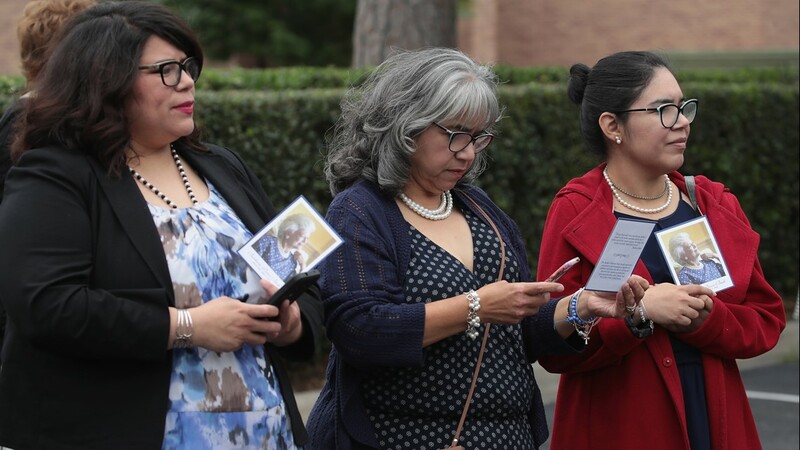 Proverbs 31 | "Who can find a virtuous woman? 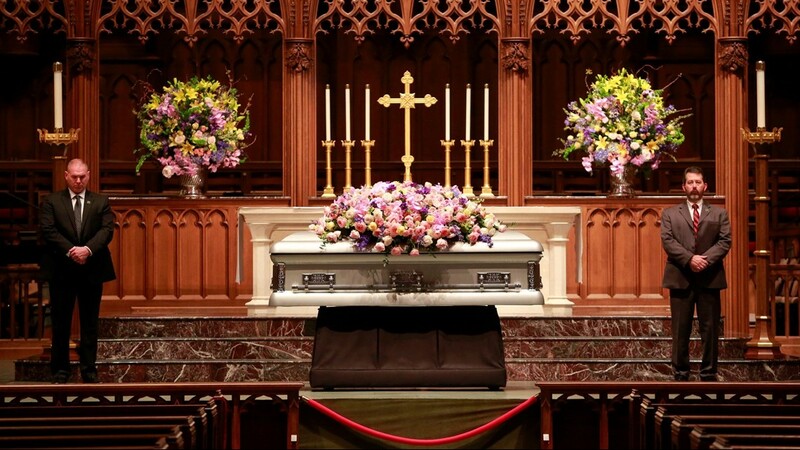 For her price is far above rubies." 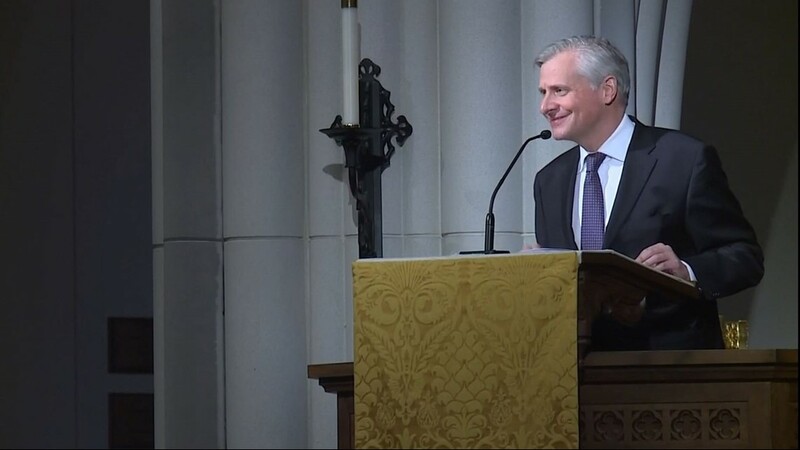 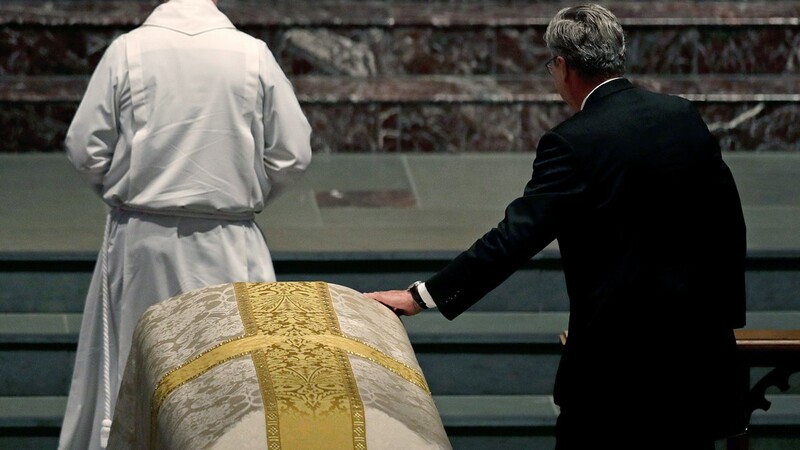 Presidential historian Jon Meacham delivers eulogy about the former First Lady Barbara Bush. 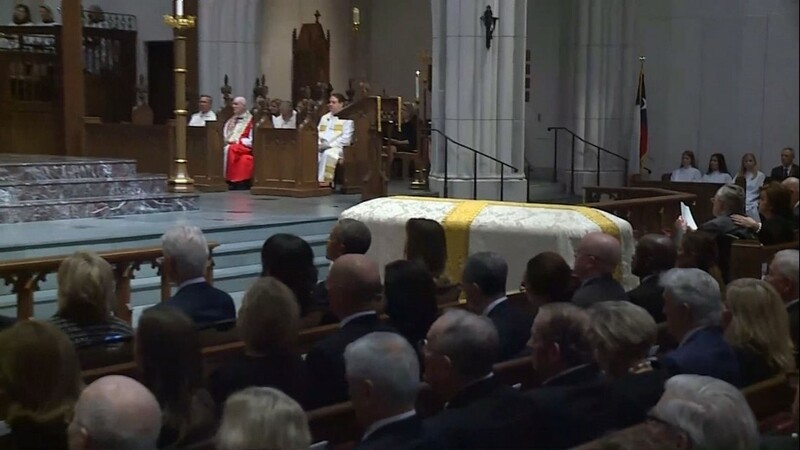 10:55 a.m., Saturday - Former President George H.W. 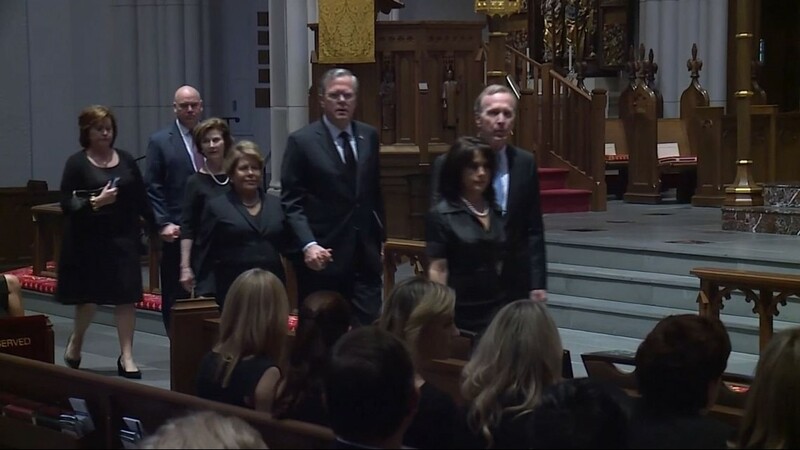 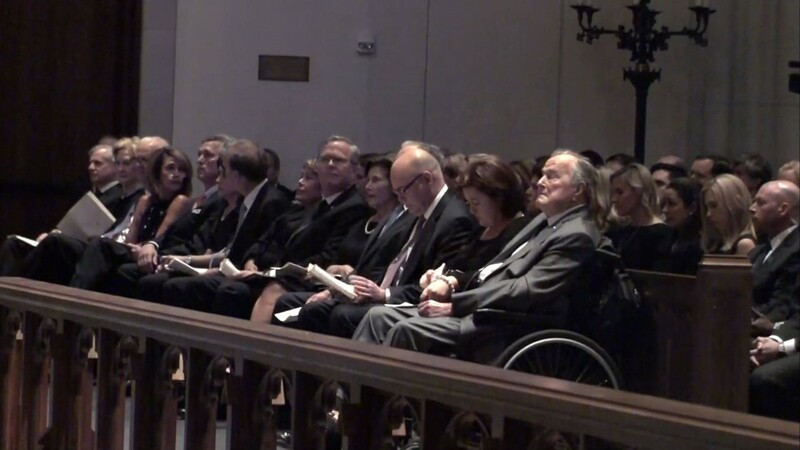 Bush and his family arrives for the service. 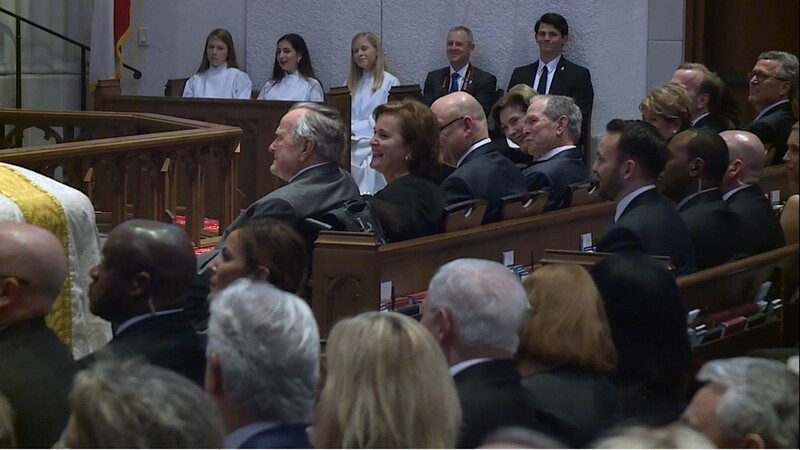 10:51 a.m., Saturday - The former first lady's grandchildren arrive for the service. 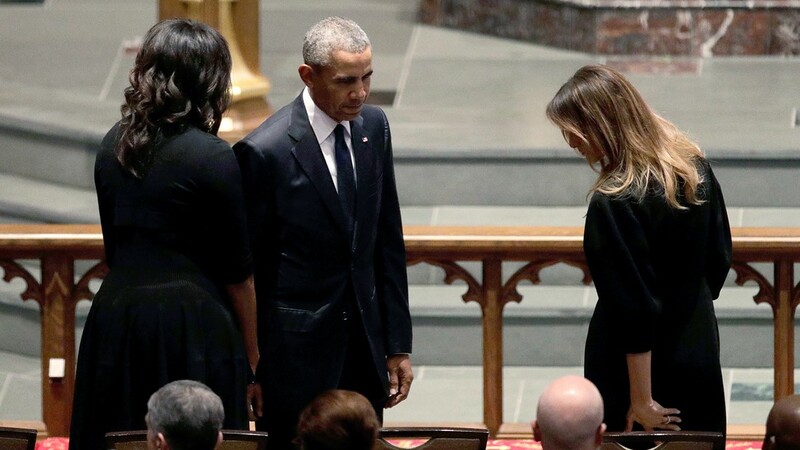 The Clinton, Obamas, and current First Lady Melania Trump also arrived for the private service. 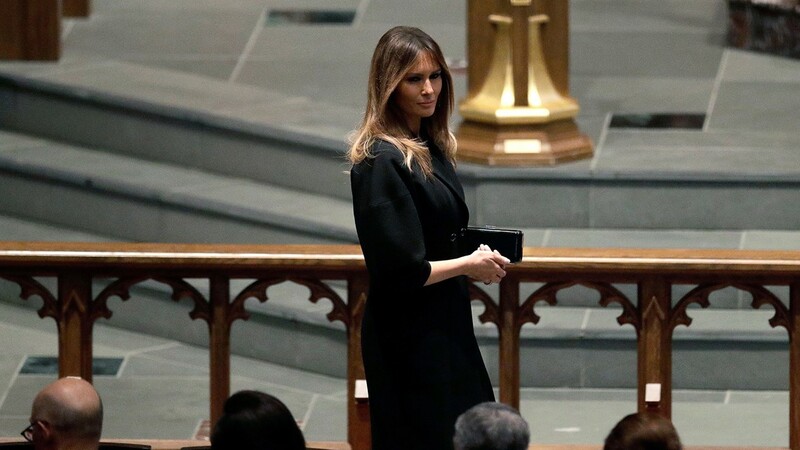 10:50 a.m., Saturday - President Donald Trump tweeted his thoughts and prayers on the former first lady including an image of her portrait in the Center Hall of the White House. 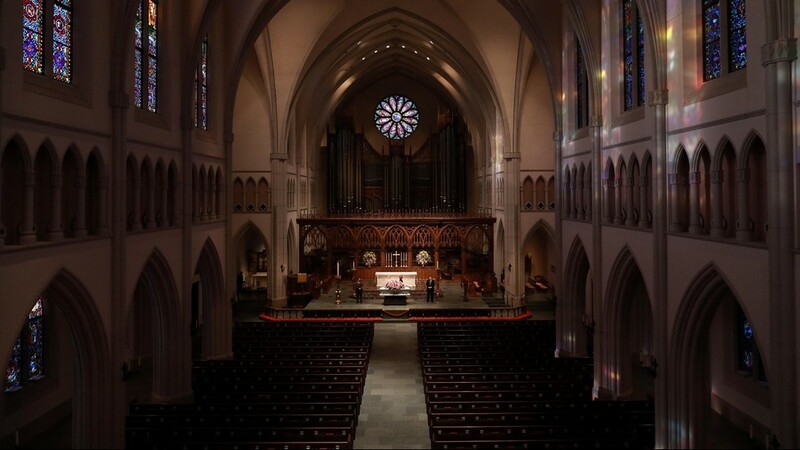 10:20 a.m. Saturday - USA Today Texas Reporter Rick Jervis provided a look inside St. Martin's as the church begins to fil up. 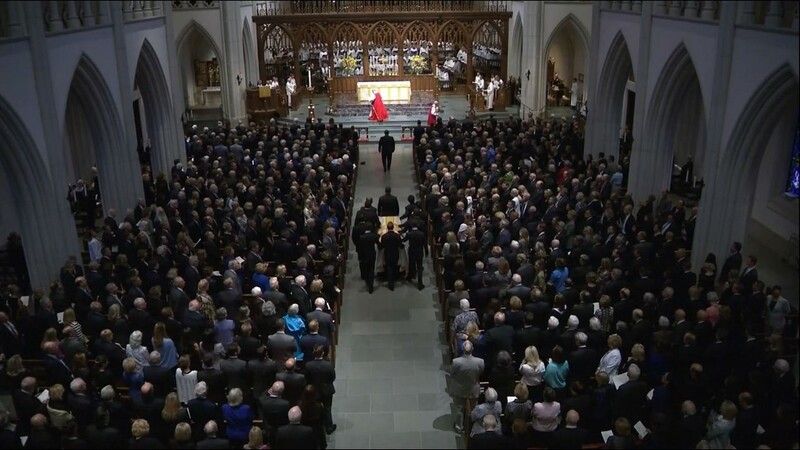 Some 1,500 guests are expected. 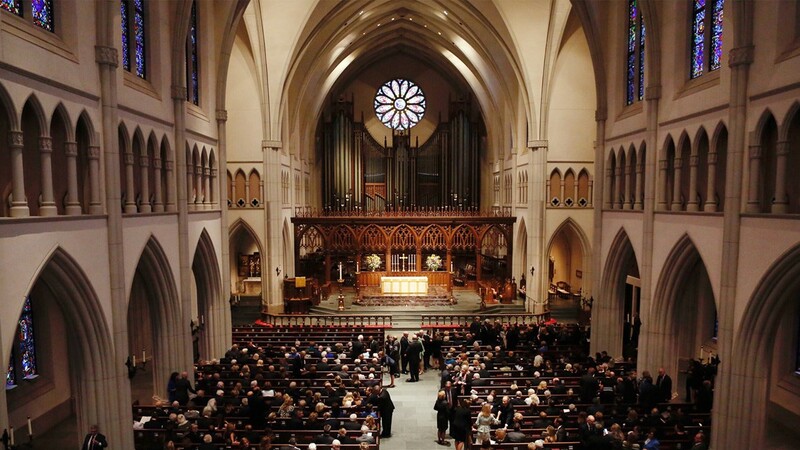 We're also seeing the last of the shuttle buses from Second Baptist arrive at St. Martin's. 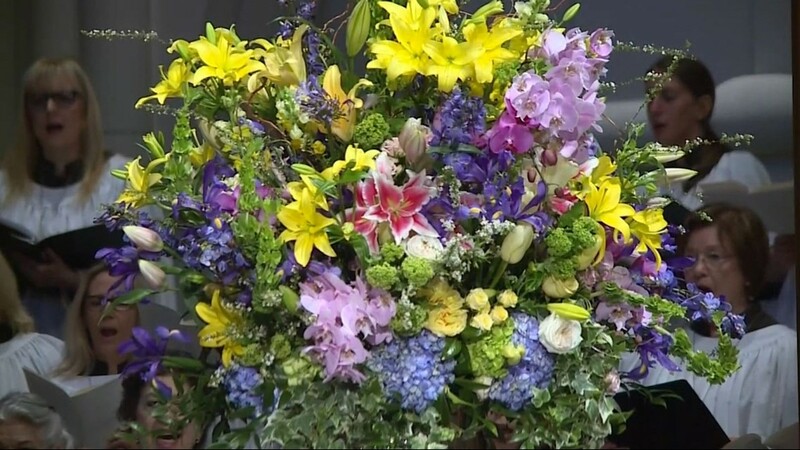 There are scattered showers in the Houston area Saturday morning. 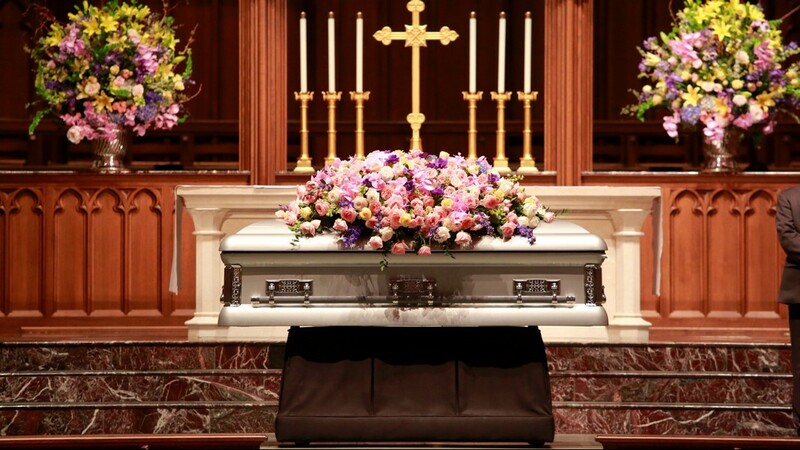 If you are planning on watching the motorcade transport the former first lady on Highway 290 later today, we recommend you set up at the Buc-ees. 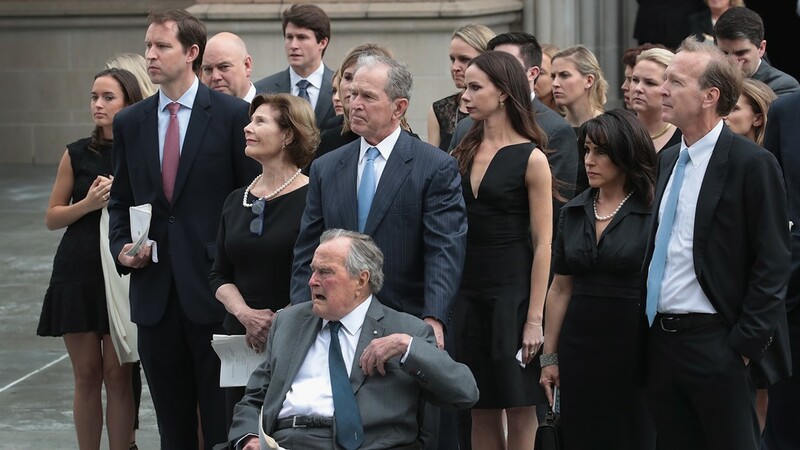 10 a.m., Saturday - We've confirmed that former President George H.W. 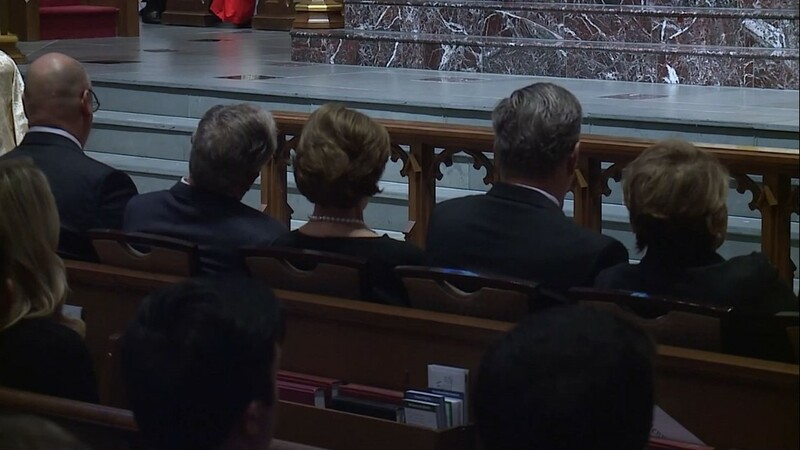 Bush is wearing a special set of socks this morning in tribute to the former first lady. 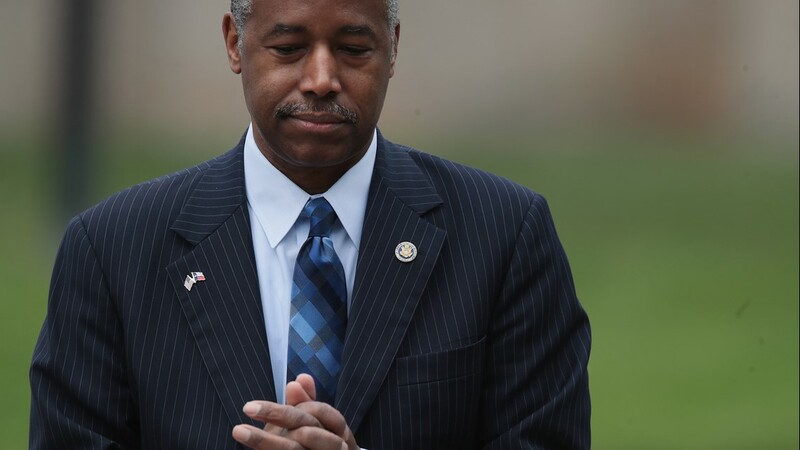 Today he will be wearing his "book socks" to honor his wife's advocacy of literacy. 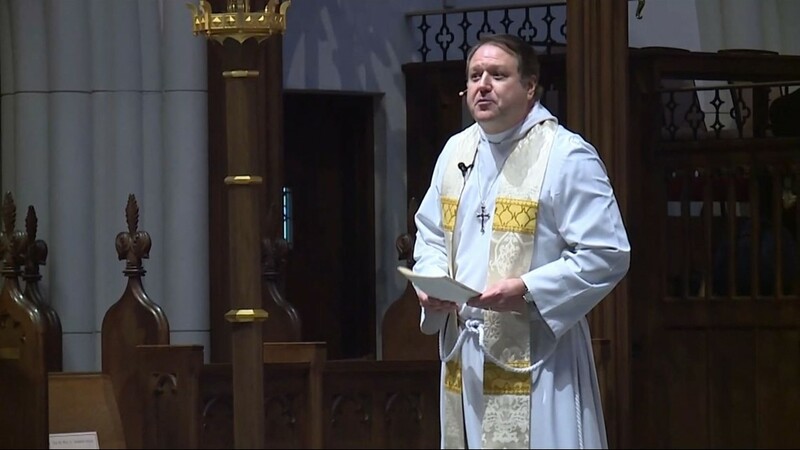 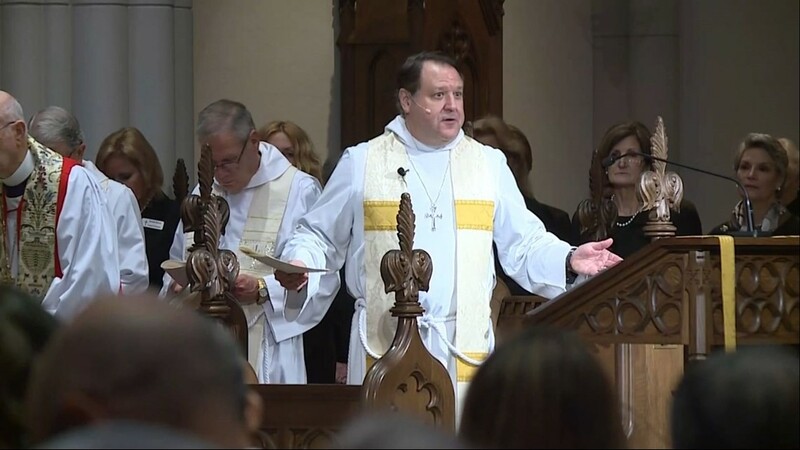 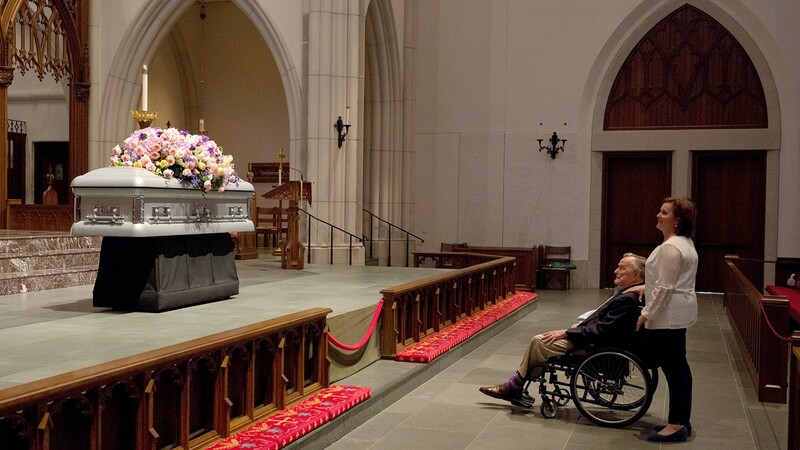 On Friday, he also wore colorful socks at the visitation. 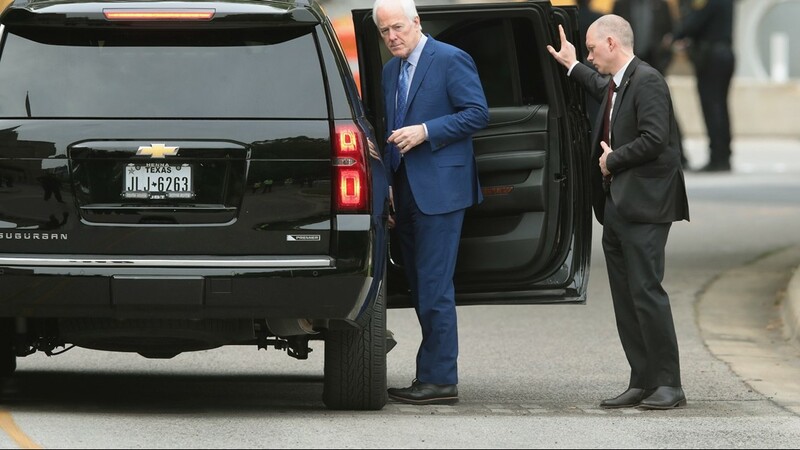 9:50 a.m. Saturday - The Oak Ridge Boys shared a photo from earlier in the day of the band flying to Houston for this morning's service. 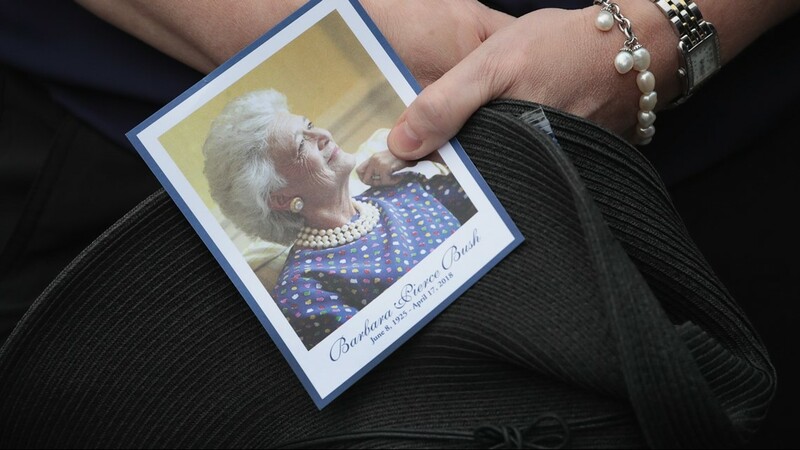 9 a.m., Saturday - Jenna Bush Hager posted this toughing photo of her grandmother this morning on Instagram. 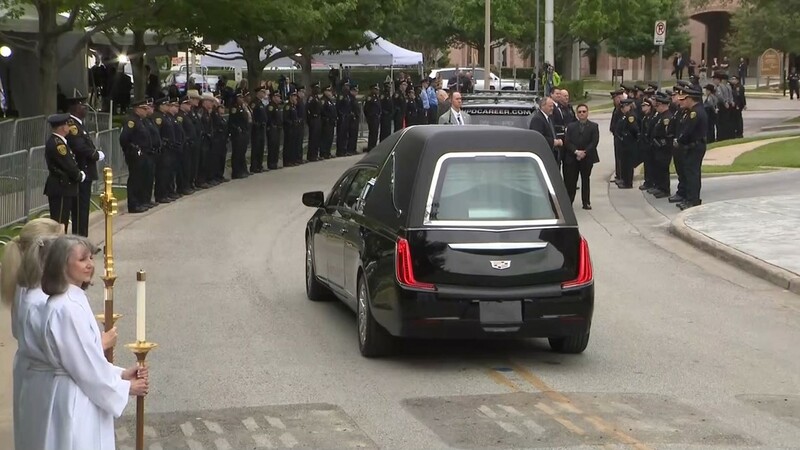 Houston police want to remind motorists to please be mindful of these road closures as you head out of the house to start your Saturday. 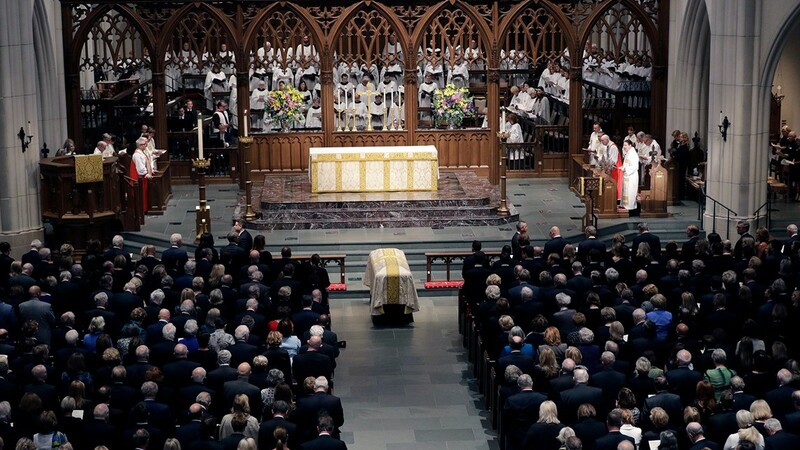 Roads will open promptly after the funeral has concluded. 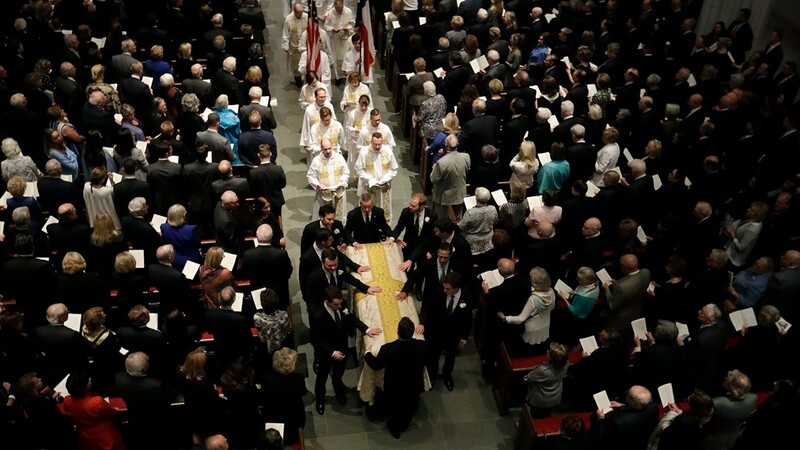 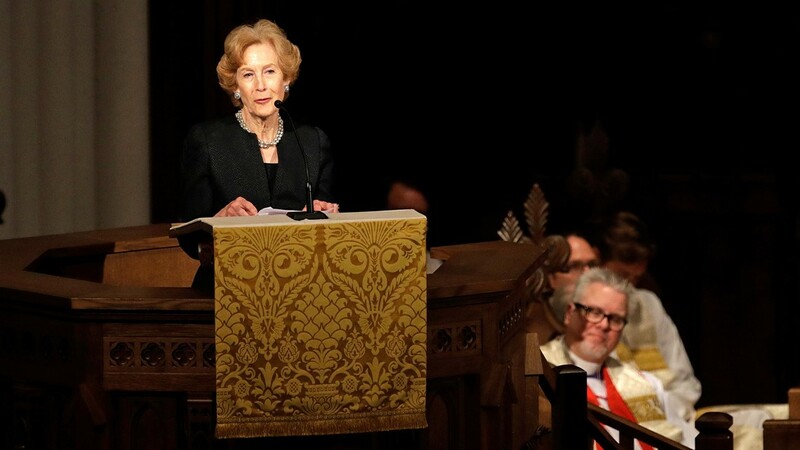 8 a.m., Saturday - The list of the 1,500 family, dignitaries and invited guests attending funeral of former First Lady Barbara Bush was released Saturday morning. 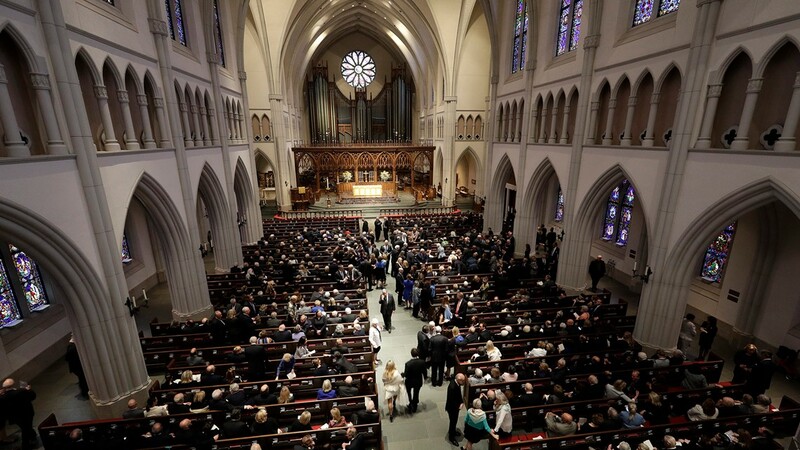 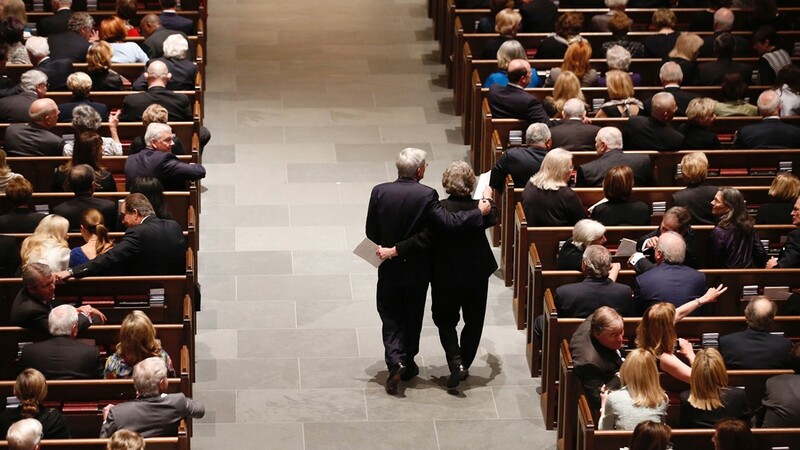 Our first look inside St. Martin’s for today’s #BarbaraBushFuneral. 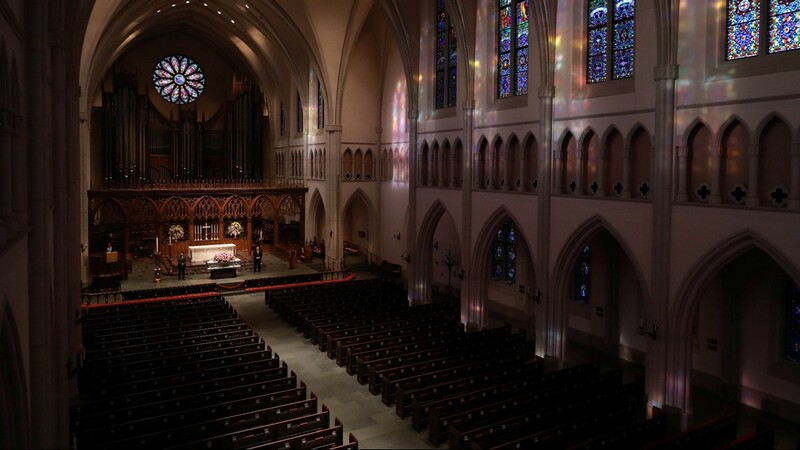 7:30 a.m., Saturday - Some of the beautiful views this morning from Memorial Park and St. Martin's. 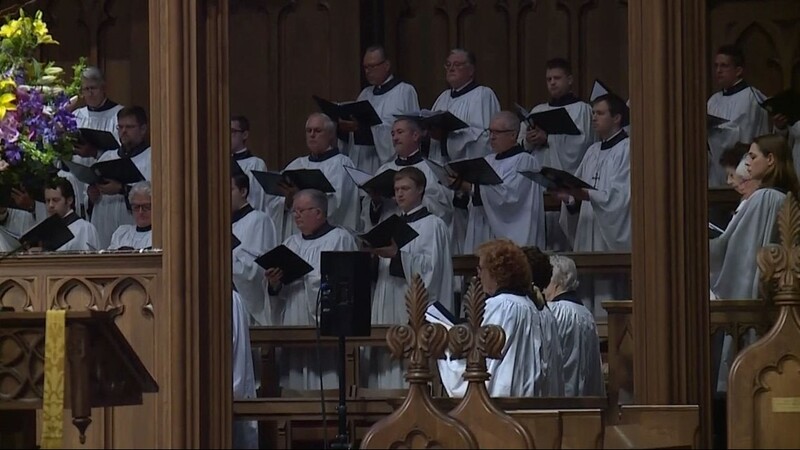 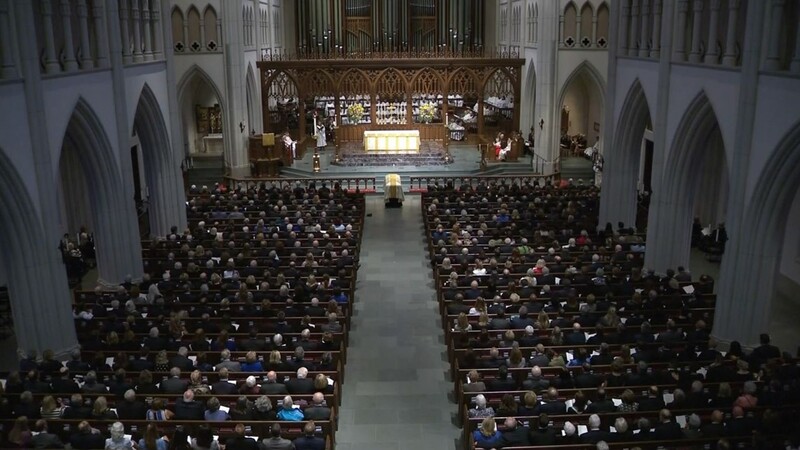 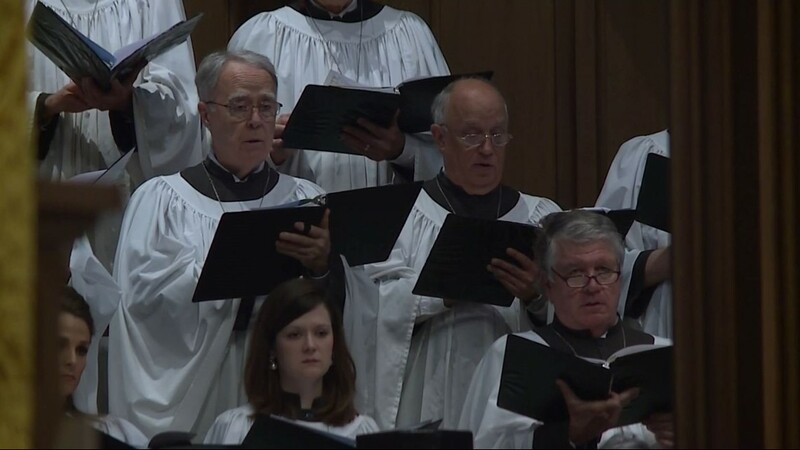 6:30 a.m. Saturday - Here is a live look this morning as we say our final farewell to former First Lady Barbara Bush here in Houston at st. Martin's Episcopal Church. 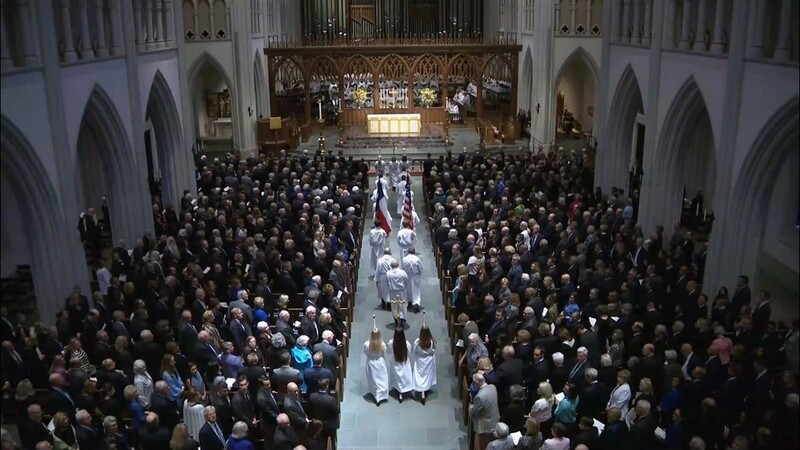 10:20 p.m., Friday -Thousands of people paid their respects at the public visitation and officials said everything went smoothly. 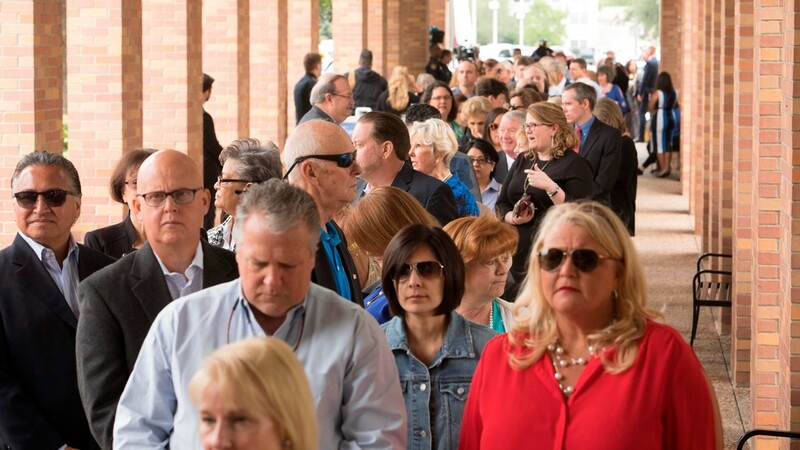 6 p.m., Friday: Lines to board the buses at Second Baptist Church bound for St. Martin's Episcopal Church for Mrs. Bush's visitation are running smoothly. 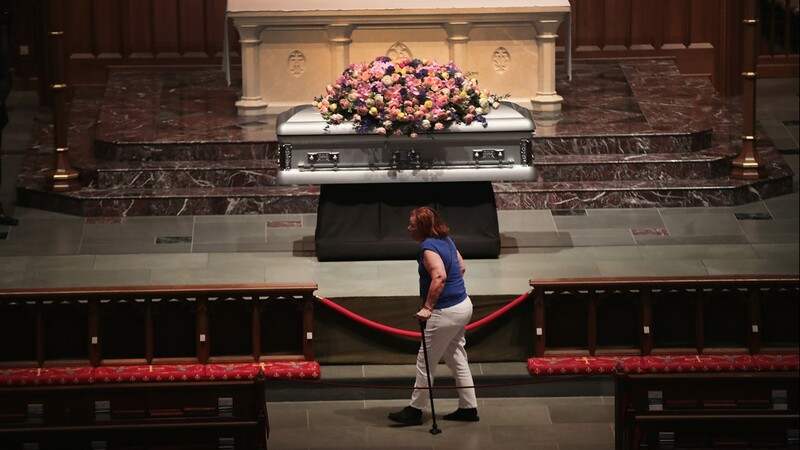 4 p.m., Friday: People continue paying their respects to Mrs. Bush at St. Martin's Episcopal Church, many wearing blue, pearls and Astros gear in her honor. 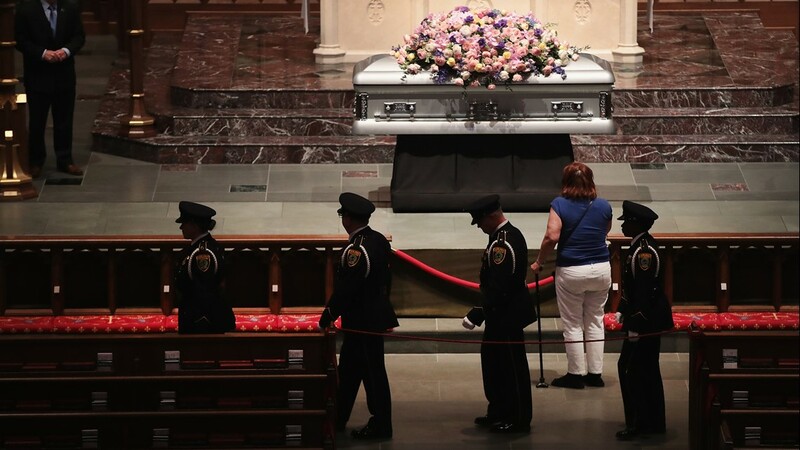 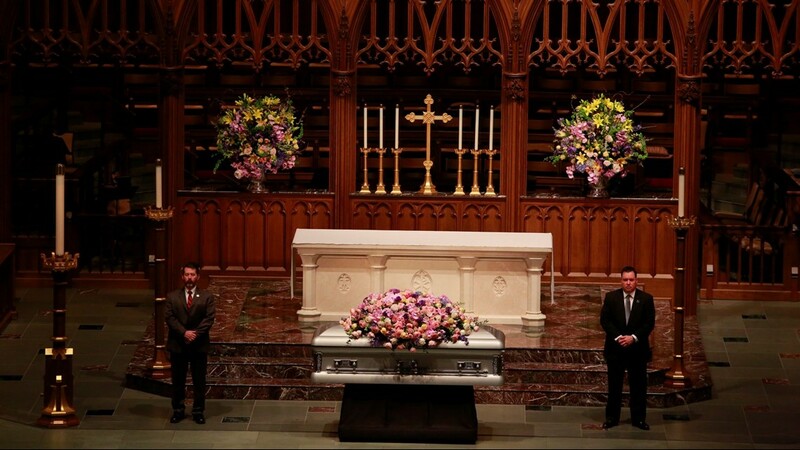 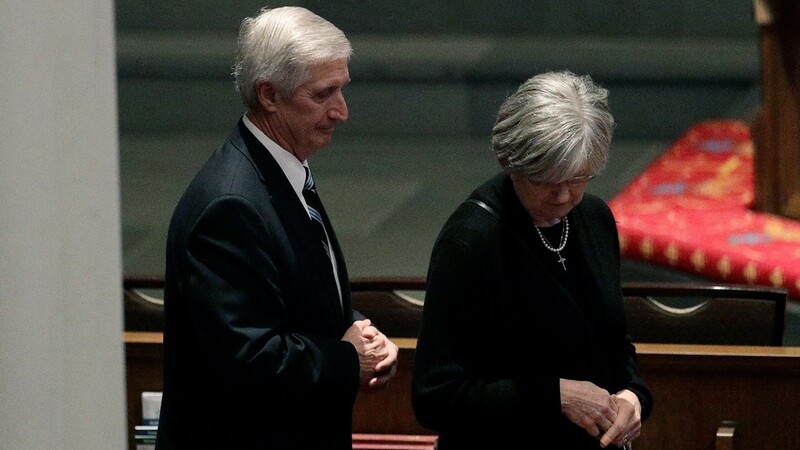 2:25 p.m., Friday: Inside, two Secret Service agents are guarding Mrs. Bush's casket. 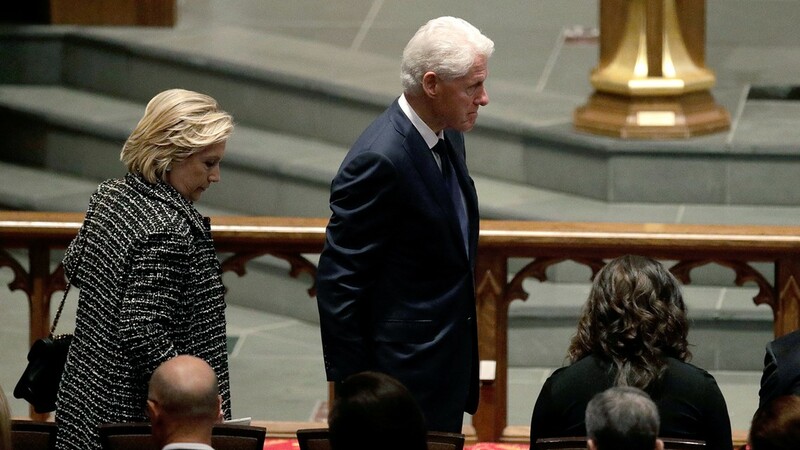 They will be by her side until burial. 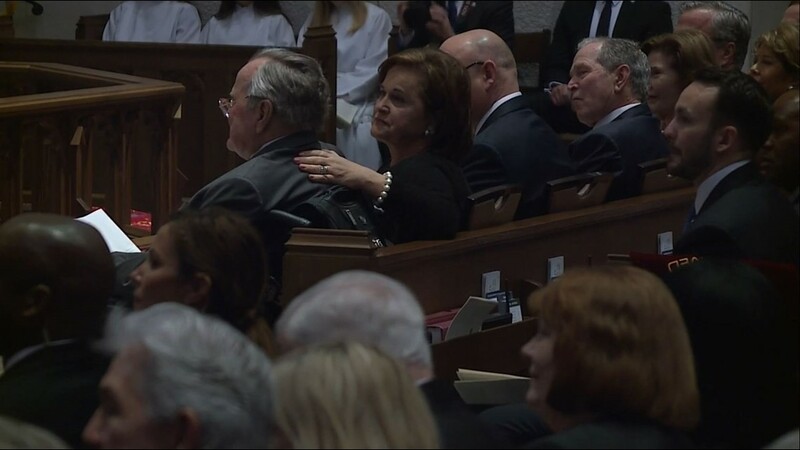 Tina Kay attended the visitation and got to shake hands with President Bush. 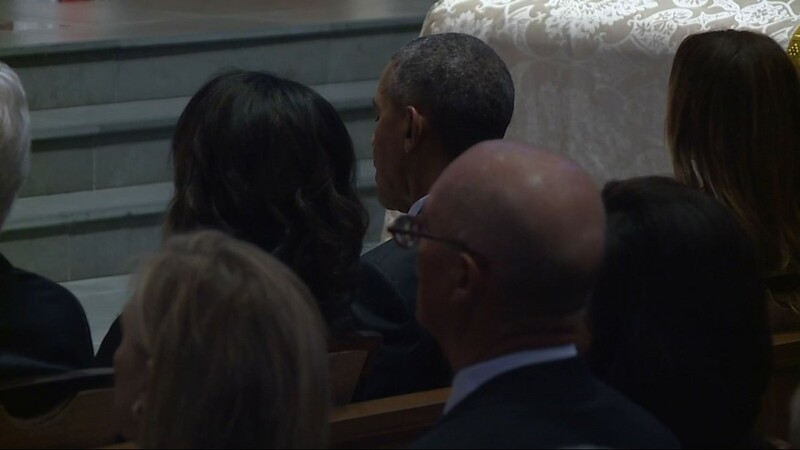 She says the former president -- referring to her Astros shirt -- asked what position she plays on the team. 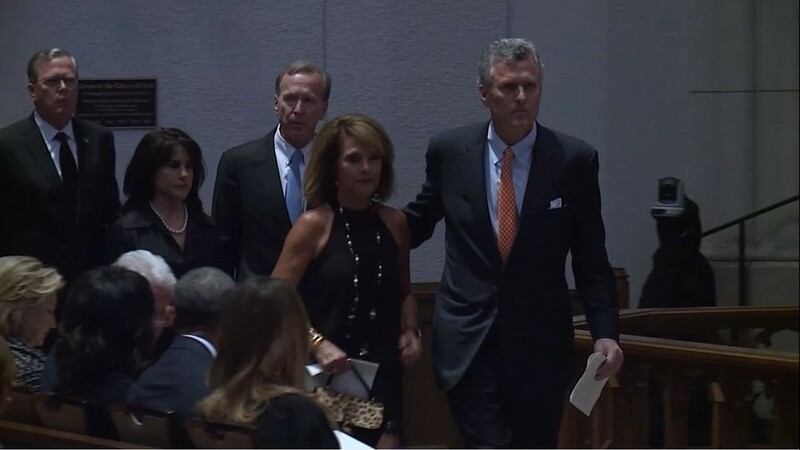 Four coworkers spent their lunch break at the visitation and were both surprised and honored to meet President Bush. 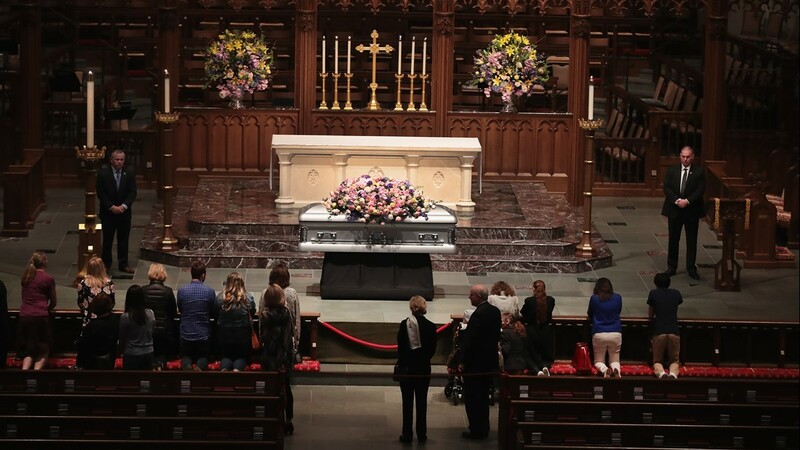 11:50 a.m., Friday: People are now entering St. Martin's Episcopal Church for former first lady Barbara Bush's visitation. 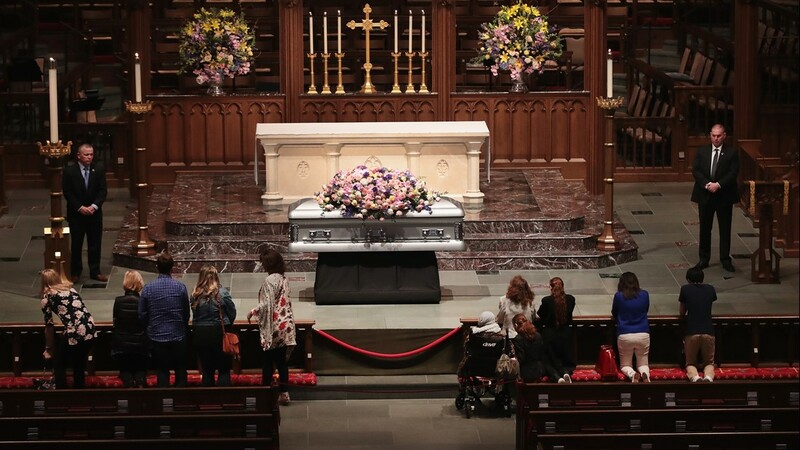 11:20 a.m., Friday: About 200 people were lined up to for Barbara Bush's visitation Friday. 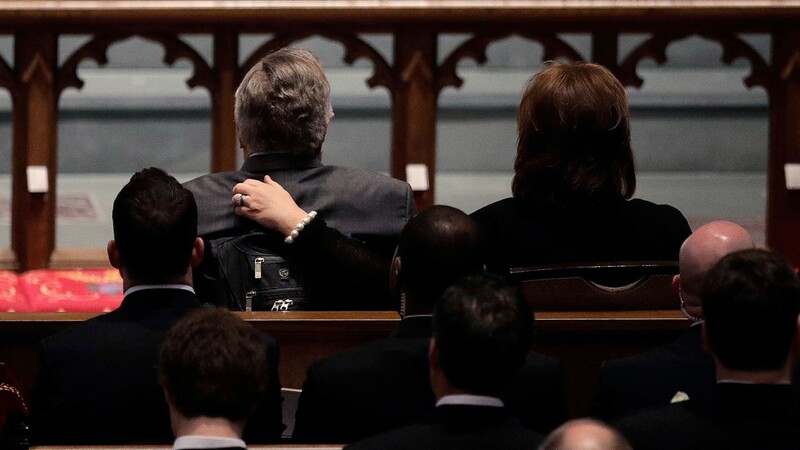 10:45 a.m., Friday: Deborah Duncan reflects on the time she invited former first lady Barbara Bush for a talk show interview ahead of George W. Bush's run for Texas governor. 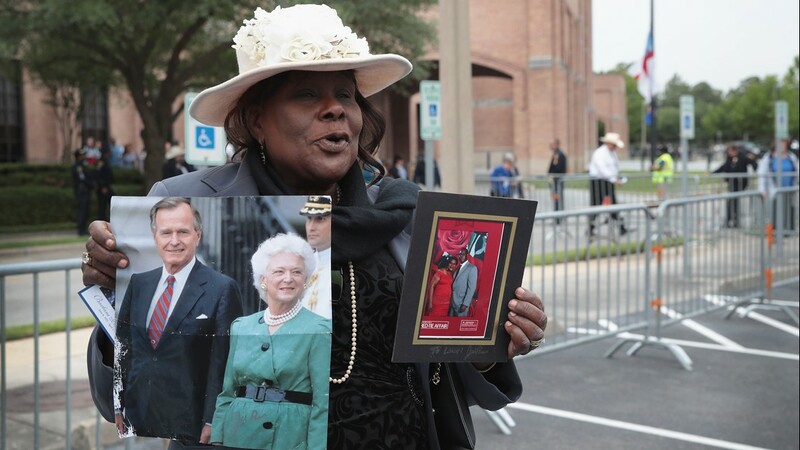 10 a.m., Friday: KHOU 11's Doug Delony and Brandi Smith cover the parking and transportation ahead of the Barbara Bush visitation. 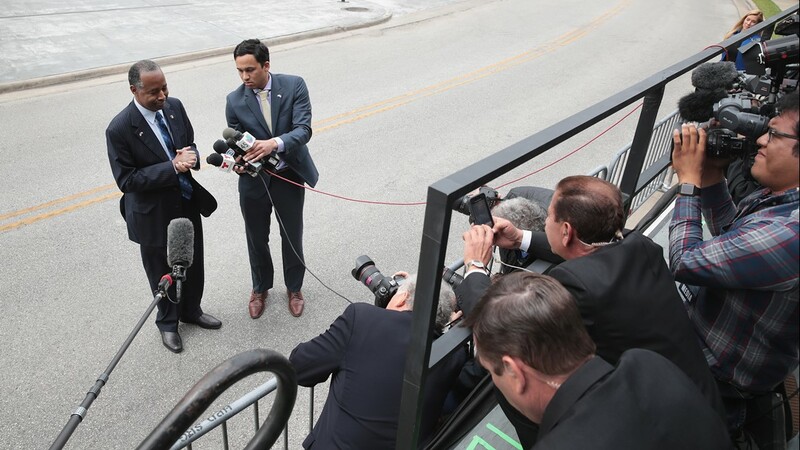 We also hear from the first three people to line up for the shuttle. 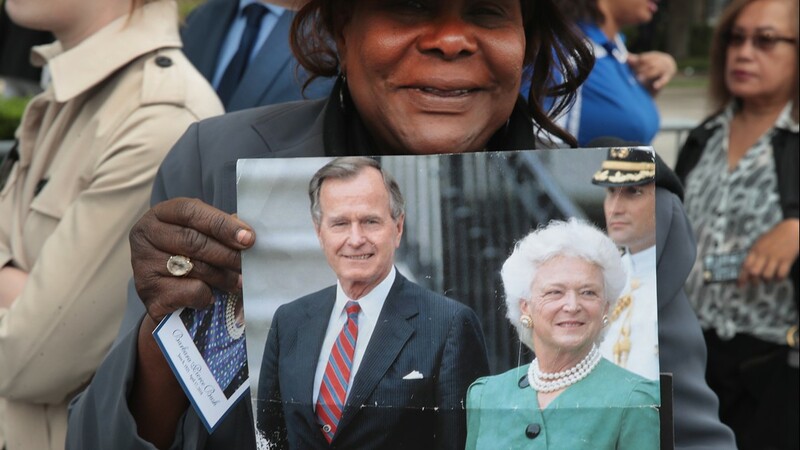 9:30 a.m., Friday: Write a message about Barbara Bush at the Literacy Plaza across the street from city hall. 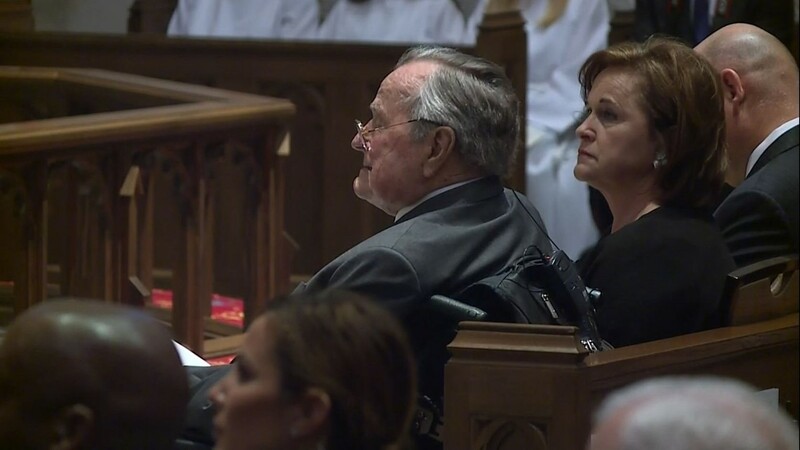 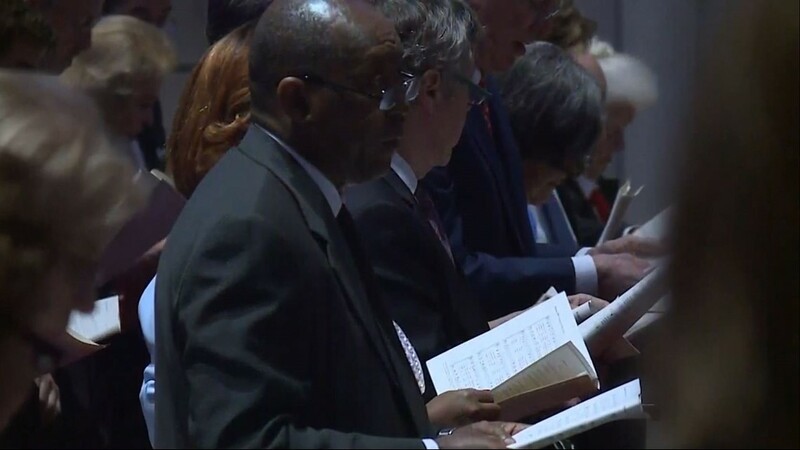 9:15 a.m.: KHOU 11's Russ Lewis and Brandi Smith reports from the Barbara Bush visitation. 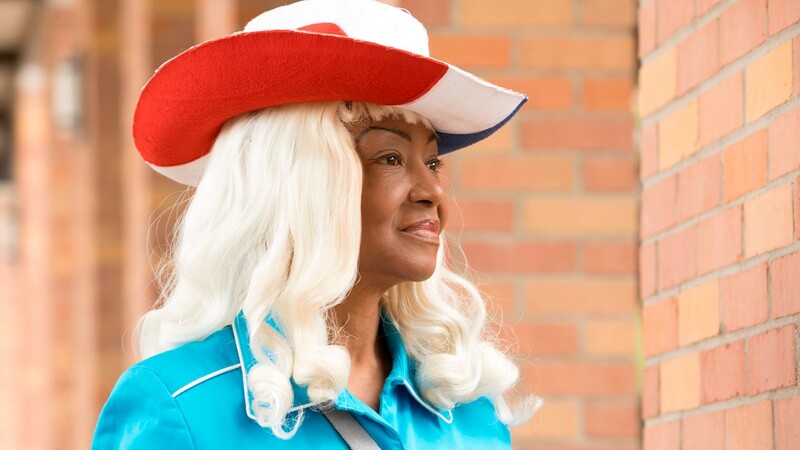 It goes from noon to midnight Friday with shuttle services running from Second Baptist Church on Woodway Drive, about two miles from St. Martin’s. 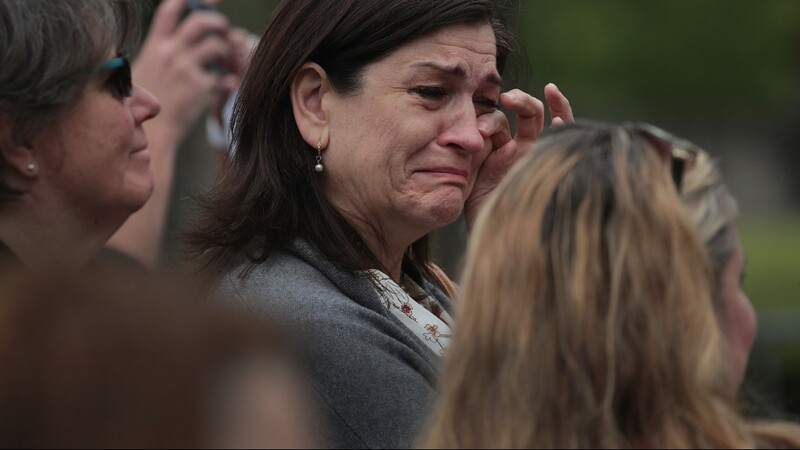 That’s where those wishing to pay their respects will go through security clearance before boarding the shuttle. 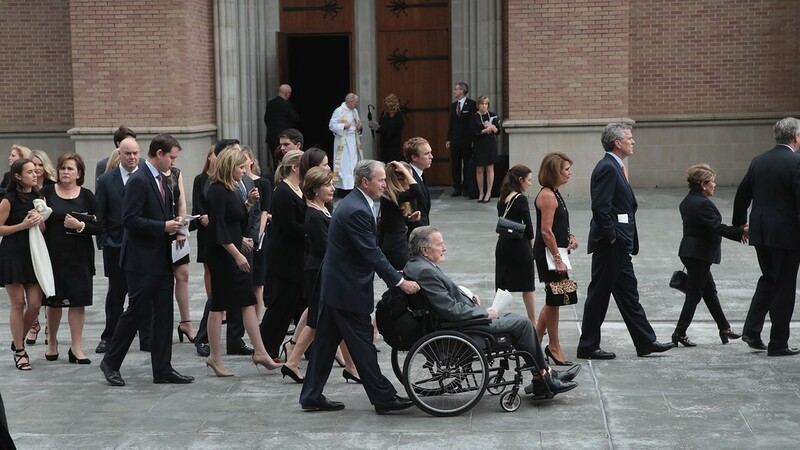 You cannot walk or drive up to St. Martin’s. 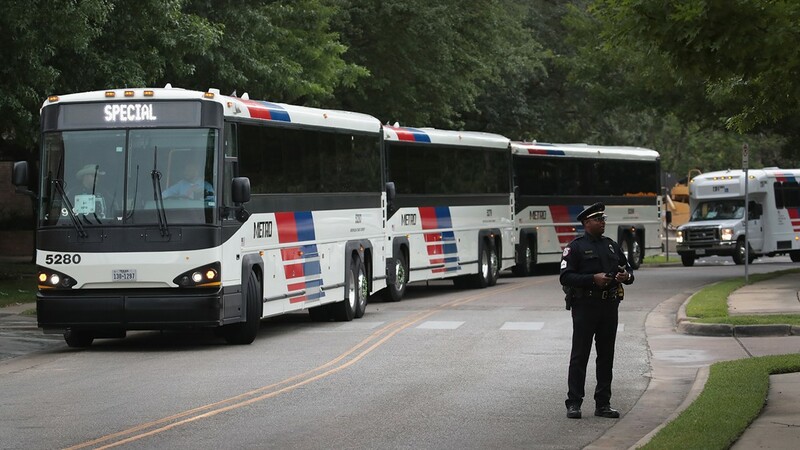 The lot at Second Baptist opens at 10 a.m. Shuttles start running at 11:30 a.m.
Security officials are advising people to bring clear bags and as few possessions as possible. 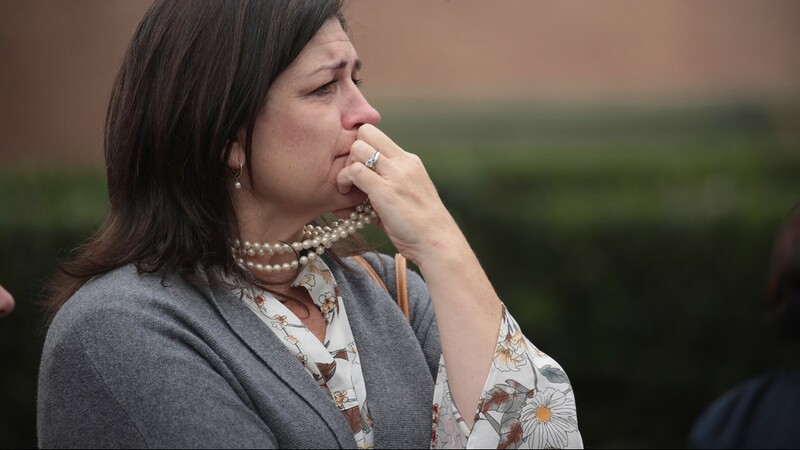 Woodway will be closed, so drivers should come in off Voss. 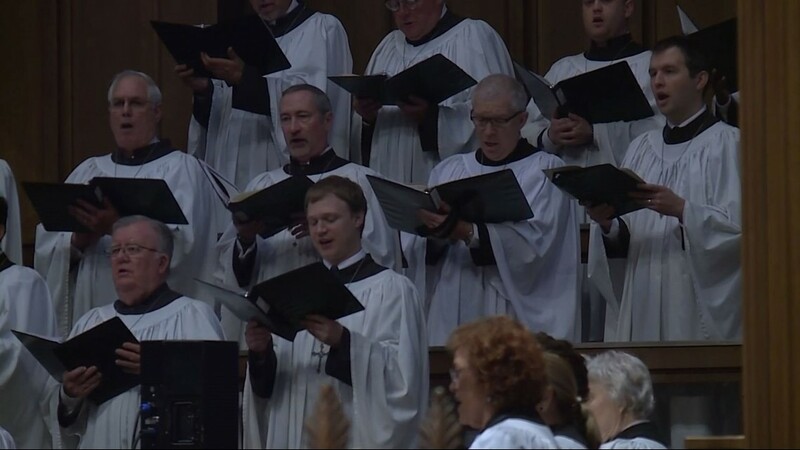 There are several different lots around the church but they are expected to fill up quickly. 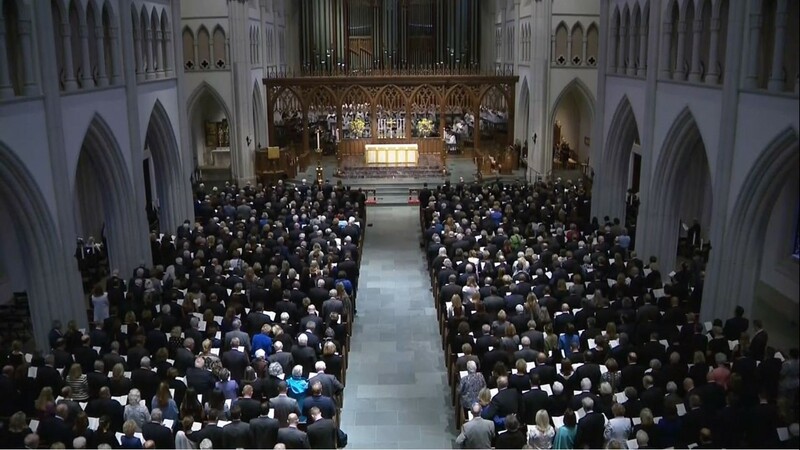 There will be a private funeral service for 1,500 invited guests Saturday.